My laptop met me with a low whirr this morning – a degree of sentience I’d hitherto suspected it incapable of. Suspicious, I poked at the Steam client and found that an update was occurring – not to Team Fortress 2 or Dota, if you can believe that, but superb lamp-clicking sim Gone Home. It’s got itself a commentary, you see, courtesy of the four fine developers at the Fullbright Company and a few notable guests. Joining writer/designer Steve Gaynor, programmer Johnnemann Nordhagen, co-writer/2D artist Karla Zimonja and environment artist Kate Craig in their about-the-house musings are three others: Sarah Grayson, whose voice infused lead character Sam with the maximum legal amount of empathy; Chris Remo, Double Fine community liaison and composer of the game’s treacly black soundtrack; and Corin Tucker, former Riot Grrrl and singer in Heavens to Betsy, who also soundtrack Gone Home in their own way. Gaynor told Eurogamer that Tucker’s audio was recorded in a study room of the Portland Public Library. The studio founder was worried that inviting her to the basement workspace of his house would be a tad too “creepy” (though evidently wasn’t so perturbed by the idea of sending his players into creepy basements). In commentary mode, you’ll find the empty house newly populated by interactable icons which spew the secrets of development upon contact. Unlike Gunpoint’s similar commentary, unfortunately, you’ll have no option to punch an artist to the ground should they drone on a couple of seconds too long. We didn’t review Fullbright’s debut – but our Rob’s Gone Home hands-on is all you’ll want to read before delving into the house on the hill yourself. The 50% Steam discount is ongoing until until early on Friday, when it’ll be too late and you’ll regret that you didn’t just buy the thing rather than simply pin this tab. It renders Gone Home £7.49 / $9.99, which is far too little. 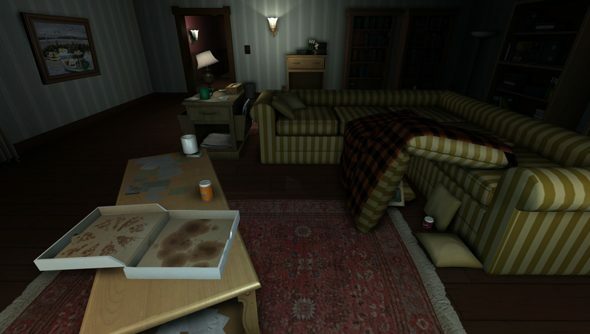 Let’s keep the comment section spoiler-free – but what about Gone Home has kept you reading til the end of this article, as a prospective buyer?